The Ministry of Foreign Affairs and Trade, the Hungarian Academy of Sciences Centre for Energy Research and the Hungarian Atomic Energy Authority will co-organize and provide professional support of the event. are the. On 21 March 2017, the Centre for Energy Research of the Hungarian Academy of Sciences, the International Atomic Energy Agency and the Permanent Mission of Hungary to the UN in Vienna held a joint press conference in Budapest about the cooperation of the IAEA and the Centre for Energy Research in Hungary. 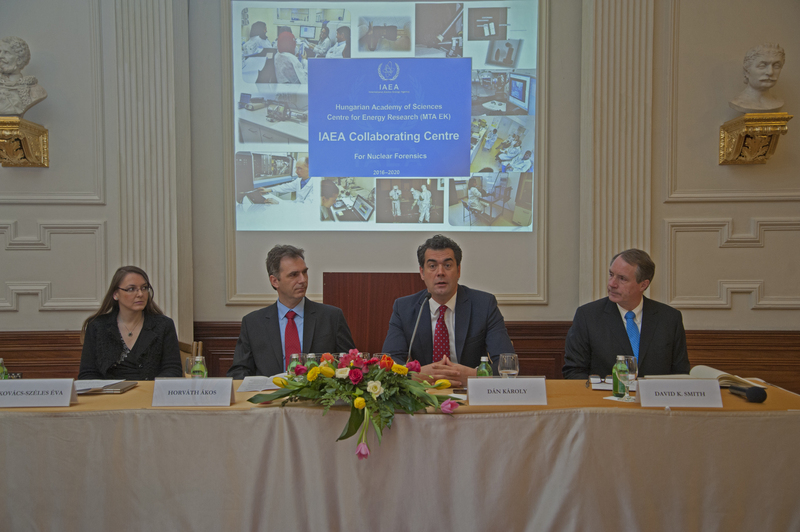 The Hungarian institute is the first collaborating centre dedicated by the IAEA in nuclear forensics. The Collaborating Centre organizes and holds international training courses and longer programs, determines innovative research areas, provides technical support and assistance to the region and strengthens nuclear security in Hungary and in the region. outreach to the Member States in addition to advances in nuclear science in the portfolio of a leading research institution (=> IAEA docu). The second run of the international Galaxy Serpent excercise was held in the second half of 2015. The excercise was sponsored by the U.S. Department of State and aimed at construct and develop National Nuclear Forensics Libraries which may „help governments determine whether nuclear or other radioactive material found out of regulatory control is consistent with their holdings and provides a basis to work with other governments against on-going transnational threats like illicit trafficking”. From Hungary the Laboratory of Radiation Safety, EK, participated the excercise among 28 national laboratories and 3 international organizations. The participation was successful, as the letter from the Director of the Office of WMD Terrorism, and the certificate from the Administrator of Galaxy Serpent attest. Further informations can be found in the interview with the administrator and in the collection of results of the previous Galaxy Serpent excercise. Hiroshi Amano, Nobel Laurate, the guest of World Science Forum took a visit at institutes of the Hungarian Academy of Sciences. The staff of the Centre of Energy Research was honoured, when Hiroshi Amano, (Nagoya University) Nobel Laurate physicist (awarded in 2014 together with other two Japanese scientists for the development of blue LED) took a whole day visit at the research centre. His visit started with a seminar talk when Professor Amano gave a lecture „Progress in III-V nitride nanodevices” in about 40 minutes, followed by very vivid discussion. The scientific carrier of the lecturer was introduced by Béla Pécz. Professor Amano did not give a historic talk on the development of blue LED, but reported on his recent research progress. The audience could see long GaN nanowires surprisingly defect free as well as transistor structures can be used at high frequency. He also stated, that GaN brought us not only the revolution of lighting, but we can expect substantial energy spare when we make power devices from this material. In this way we can decrease the loss in high power switching devices from 50% to 5%. After the seminar talk he visited the Thin Film Physics Laboratory (http://www.thinfilms.hu), which held even earlier scientific contacts to Nagoya University. Béla Pécz (and his co-workers) are investigating GaN and recently especially they study layers in high power transistors and the heat conductivity of them. This was the reason why Prof. Amano expressed his wish to visit them. He learned their results and found interesting the application of diamond and graphene in this subject. Next he visited the Nanotechnology Laboratory (http://www.nanotechnology.hu) and the 2D Momentum Laboratory which works as the part of the former one, where Prof. László Bíró P. (corresponding member of the Hungarian Academy of Sciences) and Levente Tapasztó (holds a Momentum fellowship) received the distinguished guest. The Nobel Laurate guest found especially interesting the new subject of Levente Tapasztó (novel 2D materials) in which he gained a few days before an ERC Starting Grant and financial support of 1.5 million Euro. Our guest visited the Thermohydraulics Laboratory of the Energy Centre, where scientists make a lot of experimental and computer simulation work for nuclear safety and also visited the Structural Research Laboratory of Wigner Physical Research Centre (the another centre ont eh campus), where he learned X-ray holography and the new results in crystal growth modelling. Hiroshi Amano was one of the invited plenary speaker of the 2015 World Science Forum in Budapest, but he has revealed teh direct scientific contacts as well. We were pleased to read in his letter (after he left Budapest), that although he knows that our group started a cooperation with Japan on GaN transistors in the frame of a V4-Japan projects, he expressed that he wants to establish a cooperation with us on GaN. Details of common experiments are under discussion now. Rosetta's lander Philae successfully landed on comet 67P/Churyumov-Gerasimenko. Measurements were performed with the dust impact monitor (DIM) instrument just before the separation of the lander from the orbiter and three times during descent at different altitutdes above the surface of the comet. During the adventurous triple-landing the Simple Plasma Monitor (SPM) instrument also started to measure the properties of the plasma environment. On the surface of the comet DIM was switched on five more times to measure the flux of cometary particles. Measurement data are now being evaluated and interpreted. Both instruments (DIM and SPM) were developed with significant contribution from MTA Centre for Energy Research. The historic comet landing of European Space Agency’s (ESA’s) mission Rosetta is planned to take place on the 12th of November 2014, when the orbiter will deploy its Lander, named Philae, onto the surface of comet 67P/Churyumov-Gerasimenko. The tests and calibration measurements performed since the wake up of the spacecraft from her hibernation in January 2014 have shown that all the subsystems and the scientific payloads of the space probe, including the two instruments developed with significant contribution from MTA EK, the Dust Impact Monitor (DIM) and the Simple Plasma Monitor (SPM), are ready for landing. Scientific measurements will be performed before separation from the orbiter, during descent, as well as on the surface of the comet. The latest developments regarding the Rosetta mission can be followed on the home page of the European Space Agency. 9th May. Further wake-up and testing of the scientific payloads on Rosetta has taken place. The two instruments developed and built with contribution from MTA EK (the Dust Impact Monitor of the SESAME and the Simple Plasma Monitor of the ROMAP instrument package), got underway on April 9, 2014. The almost two-week-long testing phase was divided into three blocks. In Block 1, finished on April 11, the status of the payloads and their software was assessed. The switch-on of the instruments was successfully performed; the contents of SESAME's and ROMAP's EEPROM (SESAME flight software) didn't change during hibernation. All other payloads on board were also operational. In Block 2, starting on April 14, the extensive commissioning and testing of the instruments took place. In Block 3, between April 20-23, this was followed by the execution of further Lander internal interference tests to support on-comet operation preparation. None of the instruments and subsystems on board Philae has suffered hibernation, with performances identical to those exhibited during checkouts performed more than three years ago. As a result of the tests, no change in planned operations is to be implemented. 28. March. The Post-Hibernation Commissioning of Rosetta's Lander Philae was successfully started. The switch-on of the Dust Impact Monitor (DIM) and Simple Plasma Monitor (SPM) instruments, developed and manufactured with significant contribution from MTA EK, is due on the 9th of April. The cameras of the OSIRIS payload took its first images of the destination comet 67P/Churyumov–Gerasimenko. More details can be read on the official website of the European Space Agency. 6th November Repatriation of highly enriched uranium (HEU) fuel from the Budapest Research Reactor (BRR) to the Russian Federation has been completed. The last batch of 49 kg HEU contained in spent nuclear fuel was flown to Russia in three air-shipments in the past six weeks. Operation of BRR has been converted to use low-enriched uranium fuel since January, 2013 (=> details). 23rd September András Simonits was honored by Life Achievement Award for his pioneering work in k0-NAA, and for his outstanding contributions to nuclear analytical chemistry from the International Scientific Committee of k0 Users and from the Editorial Board of the Journal of Radioanalytical and Nuclear Chemistry (=> medal and certificate). The k0 method is the most successful standardisation technique in activation analysis, providing means to perform quantitative analyses without using expensive reference materials. The k0 standardisation method spread worldwide, and has been used by the most modern neutron activation analytical laboratories. Budapest was chosen to host the 6th International k0-users' Workshop in honor to the achievements of András Simonits. The number of participants was 37 from 15 countries of all five continents (=> conference home page). 26. March The fifth Korean-Hungarian joint high technology laboratory was inaugurated at the Centre of Energy Research by Nam Kwan Pyo the ambassador of the Korean Republic and Domokos Szász the vice president of the Hungarian Academy. The laboratory may contribute to strenghtening of the safety of production of energy from nuclear sources. 10. January Mr. Tariq Shukri, the First Secrretary of the Embassy of the Kingdom of Saudi Arabia in Vienna, visited the Research Centre. He was informed about research-development issues of nuclear energy as well as the potentials available at the Centre for education in this field. 1 January Ákos Horváth was appointed as the new Director General of the Research Centre by the President of the Hungarian Academy of Science. The new Deputy General of the Research Centre is Tamás Belgya, the new Director of Finance is Ildikó Grób. They obtained their appointment for three years. 20. December László Guczi, emeritus professsor of the Research Centre, deceased. He was one of the internationally reputed founders of the catalyic research at the Insitute of Isotopes. He initiated several new research directions, and had been the mentor of generations of scientists among his scientific activities, spanning over fifty years. The number of his publications exceeds 400. 29. November The 2012 year's Leó Szilárd award of the Hungarian Nuclear Society was allotted to Árpád Veres, the former Director of the Institute of Isotopes, Hungarian Academy of Sciences. The award was handed over on the event of the Symposium of Nuclear Technics. 21. November Deputy Director General Alexander Victorovich Bychkov (International Atomic Energy Agency, IAEA) and Deputy State Secretary for Climate and Energy Affairs Pál Kovács visited the Centre for Energy Research, Hungarian Academy of Sciences. They conducted negotiations with the directorate of the research centre and visited the Budapest Research Reactor. A joint press conference was held at the end of the program where Alexander Bychkov, among others, praised the work of the Hungarian nuclear specialists, highlighting the effective cooperation of the IAEA and Hungary. 9-11. October The first annual review meeting of the EU FIRST-Nuclides project was held in Budapest and was hosted by MTA EK. The project deals with the estimation of radioactive source term from spent fuel in deep geological repositiories. During the meeting the results of the work performed in the first year of the project were presented, and invited lecturers provided presentations on the handling of spent fuel and on numerical modelling of nuclear fuel behaviour. 1-5. October Review meeting of two working groups of the EU SARNET2 network of excellence dealing with severe accident studies hosted by MTA EK was held in the KFKI campus. The participants discussed the latest results in he fields of damaged core coolability and molten corium concrete interaction. The experts visited the CERES and CODEX facilities located in the research centre. 16 July. A workshop was held to evaluate the activities accomplished during the second year of the EU FP7 Booster project (Bio-dosimetric tools for triage to responders.) The representatives of the seven participating institutions from five countries agreed upon also on the details of the practical demonstration to be held next May by the organisation of the Energy Centre. 21. June. IAEA Director General Yukiya Amano visited the Centre for Energy Research. He had been informed about the activities of the Centre carried out in relation to nuclear energy and he visited the CERES equipment devoted to model and study the cooling of the reactor vessel in connection with the enhancement of safety. 12-15. June IAEA Regional Workshop on Russian Research Reactor Fuel Return meeting was organized by the International Atomic Energy Agency with cooperation of the Centre for Energy Research. Representatives of 17 countries participating in the RRRFR project discussed the present status and future plans of the program. They agreed on the RRRFR program should be continued and financed. 10. June A report has been published in the Nature Materials (IF: ~ 30) which was prepared with the participation of the Centre's researchers. The Al13Fe4 intermetallic compound is featured as a low-cost alternative catalyst (compared to noble metals e.g. Pd) in large scale industrial processes (semi-hydrogenation of acetylene). 21. May The PhD Thesis of Tamás Fekete (entitled: Structural integrity calculation methodology of large-scale pressure vessels for fast transient loading) was presented on the session of the Scientific Council of the Research Centre. The Council propose to commence the procedure at a University and submit the Thesis, provided the proposals of reviewers shall duly be taken into account. 3. May An experts' day was held in the Hungarian Atomic Energy Authority to summarize the results of stress tests concerning the safety of nuclear reactors in the European Union and in Hungary. The experts from the Research Institute for Atomic Energy participated also in the preparation of the national Safety Report, and general director János Gadó presented also a lecture on the meeting. 6. April The executive managers of the Research and Development Division at the Downstream portfolio from the MOL Co. paid a visit at the Research Centre. Short presentations were shown to outline some methods and procedures which may attract some common interest in the future. The presentations were followed by a consultation. 31. March Representatives from the Institut de Radioprotection et de Surete Nucleaire, IRSN , France visited the Centre of Energy Research. The visit is a continuation of the cooperation of the two institutes. The representatives of IRSN presented an overview on the ETSON – European Technical Support Organisation Network. 29 - 30 March International ALLEGRO Safety Seminar was held at the Centre of Energy Research. The nuclear safety of the demonstrator of the fourth generation gas-cooled fast reactor (GFR) was evaluated by the participants of the ALLEGRO and the European FP7 GoFastR projects. 15. March Gyimesi Zoltán award was donated to the general director of the Centre of Energy Research, Dr. János Gadó, by the Minister of Development to acknowledge his outstanding management and research work performed on the field of nuclear safety.